"Understanding the details of the Galaxy in which we live is one of the great intellectual challenges embraced by modern science." I am involved in the development of routines for the photometric processing ("UNIT 5" of the Project) of data taken by the GAIA satellite (to be launched on December 2011). 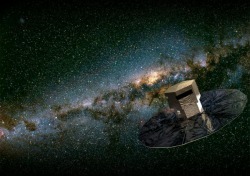 Gaia is a European Space Agency (ESA) astrometry space mission, and a successor to the ESA Hipparcos mission. It was included within the context of the ESA Horizon 2000 Plus long-term scientific programme in 2000. It is expected to be launched by the ESA in the second half of 2011, and will be operated in a Lissajous orbit around the Sun-Earth L2 Lagrangian point. In particular, I am involved in the DU11 of the UNIT 5, and I am working on java coding for the routines of BP/RP flux extraction and initial data treatment. The ESA-GAIA homepage is a good starting place for more info.